A-BEST windows are Envirosealed™ with Dura Platform spacers which reduces energy consumption, can save you up to $200 a year in energy costs, and reduces harmful CO2 emissions to produce a greener future. A-BEST WINDOW utilizes the highest quality materials, workmanship and customer service to produce a product that's affordable and professionally constructed. 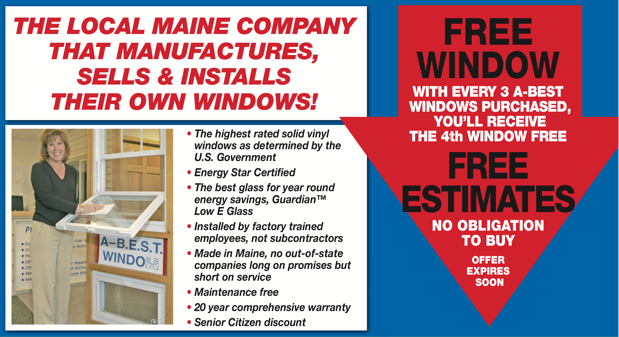 We are a Maine company that manufactures, sells and installs replacement windows. Family owned and operated since 1985, A-BEST has an impeccable track record of hundreds of thousands of installations. At A-BEST we install your windows as if we were installing them in our own home. By choosing A-BEST, you're choosing a proven company that has a demonstrated record of quality and integrity since 1985. We have completed work on all styles and ages of homes from historic capes to modern contemporaries. We also have experience in historical preservation. If you're located in the I-95 corridor between Kittery and Augusta, please contact us today to schedule an appointment. Thanks for your interest in A-BEST WINDOW. We use the highest rated, maintenance free, solid vinyl window according to USP standards and Energy Advantage glass for year round energy savings. A member of our staff will visit your home or business and take exact measurements for a custom-fit. Our windows are professionally manufactured and installed by factory-trained employees. We offer a 20-year warranty on all of our windows. 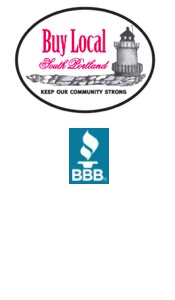 ABEST is a long standing member of the Better Business Bureau of Maine. "Not only are my (A-BEST) replacement windows energy efficient, affordable, and easy to clean, they are constructed with some of the best technology in architecture that is available today. I'd recommend A-BEST WINDOW to any homeowner who is considering vinyl replacement windows."